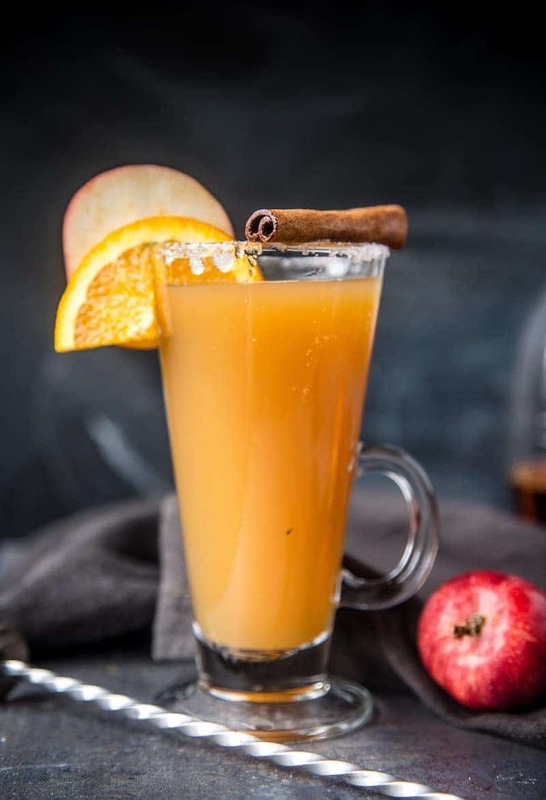 Bourbon Spiked Hot Apple Cider is an incredibly delicious and oh-so-autumn treat. It can also be served cold for a refreshing treat! It takes me awhile to finally get into the fall spirit. While most people are getting exciting about their pumpkin spice lattes in August, I’m soaking up every last minute of summer I can get. But now that it’s October, the Oregon rain has commenced, and my apple trees are screaming for attention, I’m finally accepting the fact that fall is here to stay. Well at least for a few months that is. 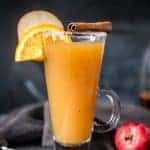 And while I still can’t get behind everything pumpkin spice in the fall, I sure can take advantage of apple season, and utilizing them in everything from our smoked apple crisp, to homemade apple sauce for the kids, and you know it, apple cocktails — like this spiked hot apple cider! Like I said, our trees are overflowing and screaming for a little love. Not to mention being surrounded by local orchards with festivals every weekend this month serving up fresh apple fritters and house made cider. And when I think cider, I think of a hot mulled boozy cider cocktail. The best part about this cocktail is that it’s super adaptable. You can make it with whatever brown booze you’ve got around (but I highly recommend Bourbon). You can make it in advance and warm it up as needed. You can make a virgin version for the kiddos! And you can even make it into a cold cocktail if you’re just not into those hot boozy beverages. It’s your call! And you don’t need to make your own cider for this recipe. This is the time of year you can get some help from the local farms who do it best. 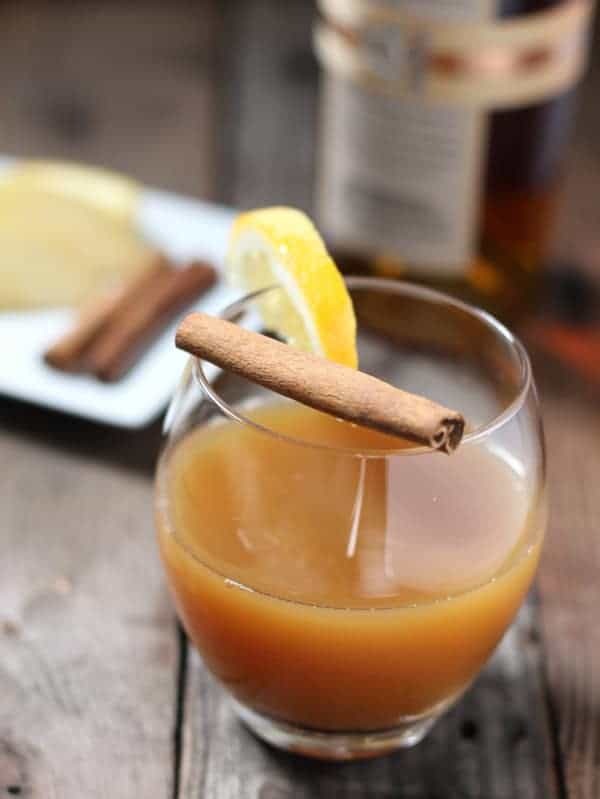 A soothing and comforting spiked apple cider made with Bourbon. Can be served warm or cold over ice. If you plan to rim the glass with sugar do that now. In the glass, add 2 oz bourbon and 1 cup of the cider mix. Garnish with an orange slice and stick of cinnamon. *Alternatively you can serve it cold. Allow the mixture to cool, strain, and then serve over ice. *For a virgin version just omit the alcohol. 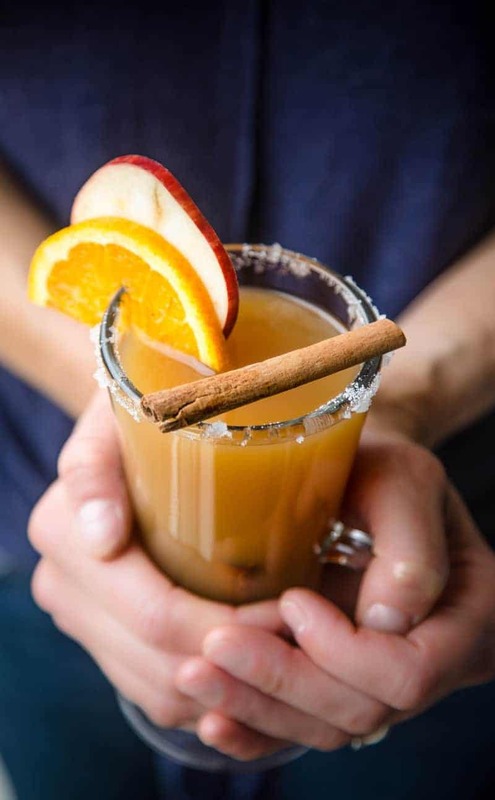 Can this Bourbon Spiked Apple Cider be served cold? Absolutely! Just let it cool and serve it over ice. It’s super refreshing that way. Can it be made without alcohol? For sure! It was originally intended to be a family friendly booze-less drink. But it sure makes for a comforting fall cocktail on a cold rainy evening. This is also an excellent cocktail for Thanksgiving too! The hot version would go well with pumpkin pie. Or serve cold over ice as an aperitif when your guests are arriving. 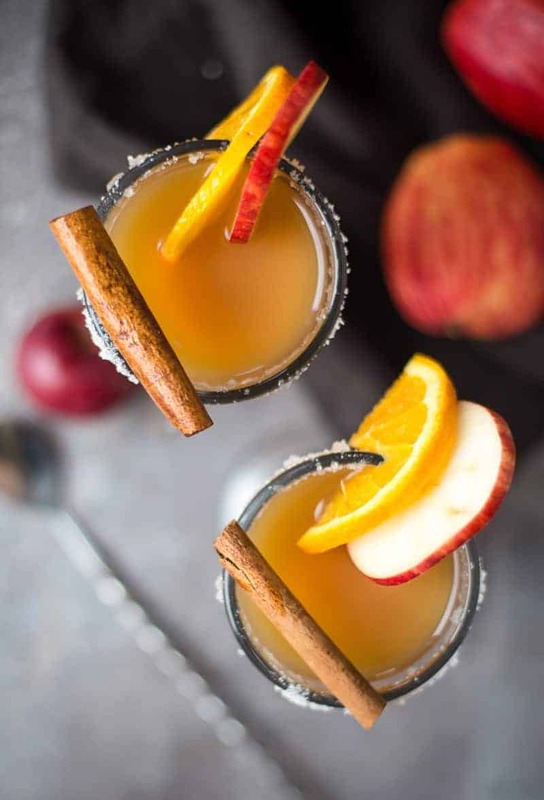 What’s the best alcohol for Spiked Apple Cider? Well, we prefer Bourbon. But you could also use whiskey, rum, cognac or brandy. What’s the best way to keep cider hot? Slow cooker, baby! If you’re having a party the best thing to do is make a big batch and keep it on the low setting in your slow cooker. That way it’s nice and warm for as long as it lasts. *This post was originally published in 2014, and edited in October of 2018 with new photos and updated content. I love hot apple cider.. and I bet the addition of bourbon really kicks the overall flavour of it up! Definitely a recipe I can see myself making all throughout the upcoming Christmas period. Thanks 🙂 It’s definitely a very festive drink for the upcoming holidays! Yup. I am so making this after work today. I have some honey bourbon that I imagine would be awesome with this! Pinning! I had to share it with my subdivision’s recipe blog…Thanks for sharing! Just made this and it’s delicious! Thanks! Want to make this for Halloween this week, but I have never made a drink like this before. What type of “clove” is recommended for the receipe? Newby question, but want to get it right as I am making it for my family and a few neighbors. Thank you. Jessica, you can use the whole cloves from the spice aisle. Just drop a few of them in. There are different “varietals” of clove, but I would definitely not worry too much about that here. Just grab some whole cloves in the spice aisle. This sounds SO good Mary, perfect for the chilly days ahead! Your pictures are stunning too! 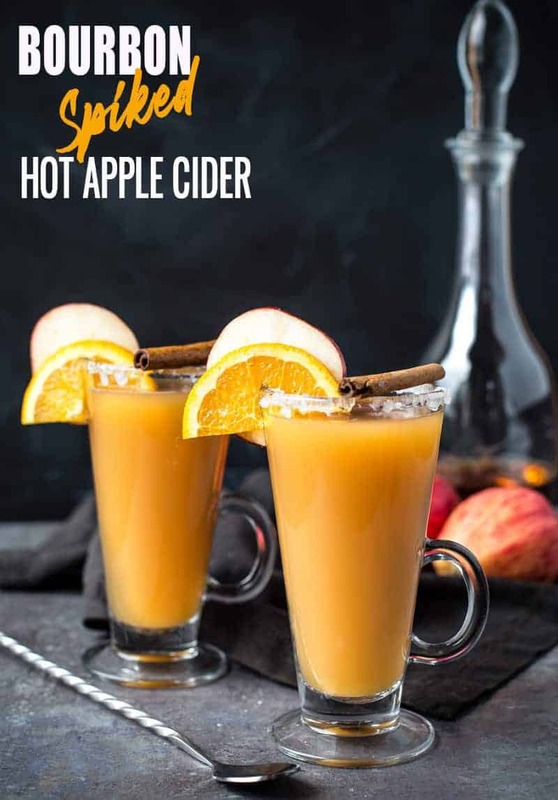 This spiked apple cider sounds perfect to me! Bourbon is my go to during the fall and winter. Cheers! Sean here – I love bourbon, it’s my happy place, and adding a little to the cider makes a fun fall cocktail!! Made this for the past 2 years for Halloween. You can pretty much double the bourbon without ever tasting it. Also, a bit of lemon juice to cut the sweetness bc between the cider and bourbon it’s VERY sweet. Jared you bring up a great point. Since we use a local cider, we know it’s not very sweet. So it will really depend on what kind of apple cider you use (we don’t specify any specific brand), and the lemon is a great idea. We also go a little conservative on the bourbon, so as you pointed out, just add more if that’s the flavor you like :). Russell, that is awesome and thanks for the feedback! !